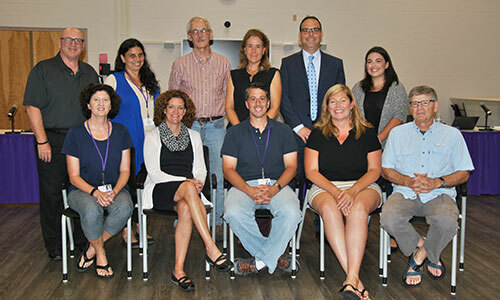 Warwick Valley Central School District Board of Education 2018-19 members are: Seated (L-R): Lynn Lillian, Denise Ginley, Keith Parsons, Sharon Davis, David Eaton Standing (L-R) John Garcia, Eilleen Gagliano, Bob Howe, Dory Masefield, Dr. David Leach (Superintendent). The Warwick Valley Central School District Board of Education is composed of nine non-paid members who usually serve three-year terms, and one student member who serves for one year. Board members are elected by the community and are volunteers who do not get paid for their service. According to the New York State School Board Association (NYSSBA), board members must fulfill certain duties to the institution and the community they serve. Such duties involve care, loyalty, and obedience. For a complete description of the duties and responsibilities of a member of the Board of Education in New York State, please visit NYS Education Department Board of Regents website. From the New York State School Boards Association (NYSSBA): These are challenging times for public education. School boards are seeking men and women who find excitement and satisfaction in confronting tough challenges and working collegially to overcome them. The board of education is a uniquely American institution. It keeps the country’s public schools flexible and responsive to the needs of their local communities. A member of a board of education in New York State takes on one of the most important responsibilities that can be assigned to any citizen: helping to plan the education of the community’s youth. The board focuses on ENDS – vision, goals and policy while the superintendent (as CEO) focuses on MEANS – objectives, plans, actions, recommendations. In other words, the board oversees the education of students and is responsible for school district operations, but does not directly run the district’s day-to-day operations. To represent well, to fulfill public trust, to lead.